Double this recipes or toss leftovers with cooked quinoa and a little extra dressing (if necessary) for a light, high protein dish. Summer cooking at its best is easy, colorful and uncomplicated. Ratatouille makes the most of the vegetables of the season. This grilled version can be prepared in two ways. The vegetables are first grilled and you then dress them right at the table and serve them immediately or you finish marrying their flavors over the stove top. Both are delish--it's just a matter of choice. I tend to prefer the first method, as it's simpler and doesn't heat up the kitchen. Prep your vegetables and start up the grill. When the fire is ready or the grill is hot, liberally with olive oil. Place the eggplant, zucchini, onion and peppers and tomatoes on the grill, keeping them separate of each other. If you are using a fire grill, make sure the rack is about 4 inches above the fire. Grill until vegetables are golden--about 5-10 minutes--continue cooking the peppers until their skin blisters. Grill time may vary depending on whether you are using an electric grill or gas fire--so watch closely. At this point you can decide whether to continue grilling the vegetables until they are softer or you can remove them from the grill and combine them in a large pot to allowing them to soften over a lower, longer heat as it true of most traditional ratatouille. My personal preference is to continue to grill them until they are bit softer (about 5-7 more minutes) then I combine them at the table. Toss with the thyme, basil, red wine vinegar and garlic (if desired). Cover and allow the ratatouille to rest for about 10 minutes. Add salt and pepper to taste. Remove the vegetables from the grill. In a large pot over medium heat, warm 2 T of olive oil. Add in onions and cook until soft--about 7 minutes. Add in the other vegetables and simmer, stirring occasionally for about 30 minutes. Finally, add in garlic, thyme, basil and vinegar. Cook for another 5 minutes. Remove from heat and season with salt and pepper. Transfer to a platter and serve at room temperature garnished with basil leaves. Lovely with quinoa or amaranth. 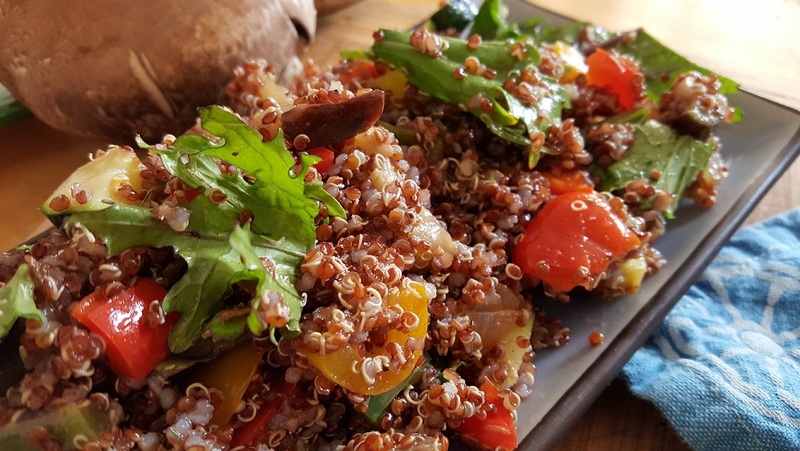 Double this recipe or use leftovers and toss them with cooked quinoa and extra dressing for a high protein and light summer dish.